Today's card is for the color challenge over on SCS, to use basic black, rose red and always artichoke. While I use basic black and rose red quite often, it has been some time since I last used always artichoke. I do like the color, but it seems too dark, so I rarely reach for it. I do like how this color combo turned out, but had to add a rose red designer paper with some brighter colors in it. I love this mushroom image, had to use it again. It is a digital image available at my etsy store, the Digital Stamp Oasis. Image was printed on GP white 110lb as a wallet size with my HP inkjet printer. I colored it using prismacolor markers and copic markers. I sponged the edges with soft sky ink and added glitter to the butterfly and mushroom dots, and I also added stickles to the designer paper. To finish the card off, I added the black gingham ribbon, did some paper piercing on the scallop circle, and attached prima flowers with rhinestone brads. Thanks so much for looking. Have a wonderful day. For more product info see recipe below. Accessories: prima flowers, rhinestone brads, gingham ribbon, stickles, swiss dots cuttlebug folder, big kick, scallop circle nestabilities. Beautiful! I just love all the color on this card! Great image, too! Those dotted flowers are great, too!! TFS! Ooh! I had completely forgot about the color challenge over on SCS...I'm glad I came to visit!! Your card came out sooo cute and the image is adorable! tfs!!! Great combo of the image and patterned paper. I think that artichoke works great on this card. This is a great color combo...i like the little cut out oval (it looks cut out...is it?) with the word inside. Very cute. So many things to love about this card! First, I just adore this image...the mushrooms, the butterfly...and I like how you sponged a background in (I so need to do that!) and I love how you mounted it on a circle scallop! So original...this card rocks! Super job with the combo. I never did manage to get to it yesterday -- sigh -- maybe later today. Your card is super lovely and I adore that image! 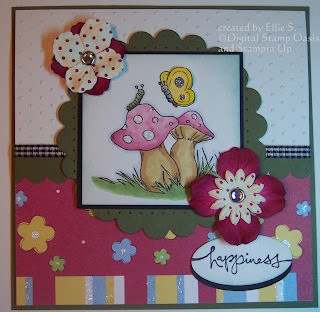 So cute....great color combo...and those mushrooms are the CUTEST! This is so much fun! Love the way your coloring came out! That is a nice color challenge, I hope I can play this week. Your card is so cute! my first thought was...."OH look at those flowers and all the bling, LOL"
VERY PRETTY!!!! I love the colours - it makes the mushrooms look so yummy!!!! Love it! Great color combo.